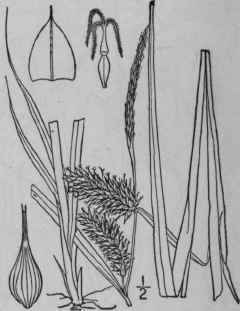 Carex oligosperma Michx. Fl. Bor. Am. 2: 174. 1803. Glabrous, culms very slender, erect, rather stiff, 1 1/2°-3° tall, long-stoloniferous. Leaves about 1 1/2" wide, not exceeding the culm, involute when old; bracts similar, overtopping the culm; staminate spike stalked, narrowly linear; pistillate spikes 1 or 2, sub-globose or short-oblong, 5"-10" long, sessile or the lower short-stalked, 5-15-fiowered, or the upper sometimes reduced to 1 or 2 perigynia and with a staminate summit; perigynia ovoid, erect, inflated, strongly few-nerved, yellowish green, shining, 2 1/2 long, about 1 1/2" in diameter, contracted into a minutely 2-toothed beak; scales acute or slightly mucronate, much shorter than the perigynia; stigmas 3. In bogs, Labrador and Newfoundland to the Northwest Territory, south to Massachusetts, Pennsylvania and Michigan. June-Sept. Ascends to 4000 ft. in the Adirondacks. C. lurida Wahl. Kongl. Acad. Handl. (II.) 24: 153. 1803. Carex tentaculata Muhl. ; Willd. Sp. PI. 4: 266. 1805. C. tentaculata var. parvula Paine, Cat. PI. Oneida 105. 1865. Carex lurida var. flaccida Bailey, Mem. Torr. Club 1: 73. 20: 418. 1893. Carex lurida var. exundans Bailey; Britt. & Brown, 111. Fl. Glabrous, culms erect, smooth or slightly scabrous above, 6'-3º tall. Leaves elongated, rough, 2"-3 1/2" wide, the upper and the similar bracts usually much overtopping the culm; staminate spike usually solitary, elongated, from nearly sessile to long-stalked; pistillate spikes 1-4, globose to oblong-cyiindric, densely many-flowered, 1/2'-2 1/2' long, 7"-10" in diameter, the upper sessile and erect, the lower peduncled and erect, spreading or drooping; perigynia inflated, shining, ovoid, strongly about 10-ribbed, contracted into a long subulate beak, ascending or the lower spreading, 3'-41/2" long, thin, yellowish green, longer than the rough-awned scale; stigmas 3. In swamps and wet meadows, Nova Scotia to Minnesota, Nebraska, Florida and Texas. Very variable. June-Oct.
C. gracilis R. Br. 1810. Carex Baileyi Britton, Bull. Torr. Club 22: 220. 1895. 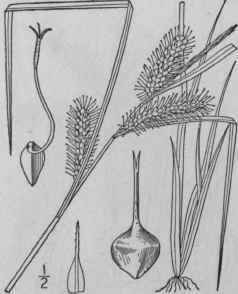 Glabrous, culms erect, slender, minutely scabrous above 1-2° tall. Leaves roughish, elongated, 1"-2" wide, the upper and the similar bracts exceeding the culm; staminate spike solitary, more or less strongly peduncled; pistillate spikes 1-3, narrowly cylindric, densely many-flowered, all erect or ascending, 9'-2' long, about 4"-6" in diameter, the upper sessile, the lower more or less stalked; perigynia inflated, ovoid, 2 1/2'-3" long, ascending, abruptly contracted into a. subulate 2-toothed beak about as long as body, prominently about 10-ribbed, the lower about equalling, the upper longer than the linear-subulate rough-awned scale; stigmas 3. Bogs, Maine and Vermont to Virginia and Tennessee. June-Aug.